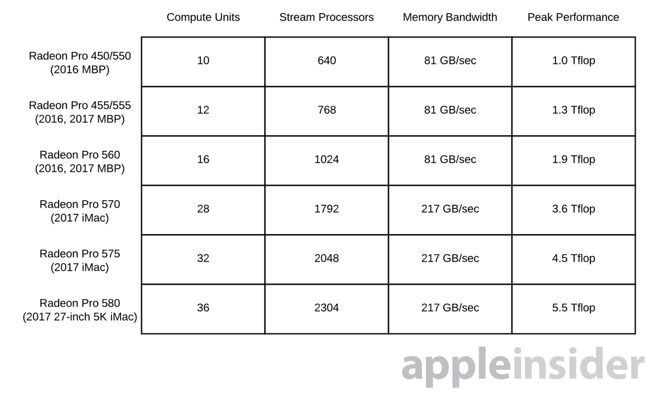 As with the initial Radeon Pro release with the 2016 MacBook Pro, Apple hasn't provided that much detail on the same family of GPUs used in the new iMacs —but AMD has shed some light on the new processors, showing a radical improvement over the predecessors. According to AMD, The Radeon Pro graphics found in the MacBook Pro and iMac feature the latest "Polaris" architecture with 4th generation Graphics Core Next. As with the GPUs in the series in the MacBook Pro, the new iMac GPUs feature AMD's asynchronous compute technology, updated shader engines, enhanced memory compression and new geometry capabilities. The speeds in the new Pro 570, 575, and 580 beat out the MacBook Pro's set. The Pro 570 nearly doubles performance of the Pro 460 and 560 in the highest configuration of the MacBook Pro possible. The Pro 580 is 2.9 times faster in single precision than the Pro 560. In comparison, the Iris Graphics 540 found on the 13-inch late 2016 MacBook Pro has a peak performance of 806 gigaflops, with the 550 in the higher end configuration coming in at 845 gigaflops. The 2013 Mac Pro desktop GPU D300 FirePro is capable of 2 teraflops per GPU, and the computer holds two. The D500 FirePro can provide 2.2 teraflops per GPU. The Nvidia 1080ti with a native PCI-E connection for around $700 delivers around 11.3 tflop, with the $500 1080 coming in at 9 tflop. The $1200 Titan Xp hits around 12 tflop. The 4K iMac has a 3.0 GHz quad-core i5 processor with a Radeon Pro 555 GPU, 8GB of RAM, and a 1TB 5400 RPM hard drive for $1299. With a 3.4 GHz i5 processor, a 1TB fusion drive, and the Radeon Pro 560 GPU chipset, the cost climbs to $1499. 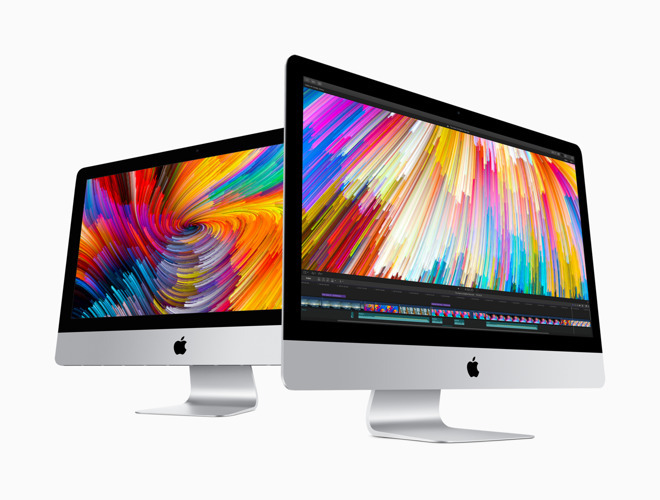 As far as configurations for the 5K iMac, the quad 3.4 GHz i5 model, with 8GB of RAM, a 1TB Fusion Drive, and the Radeon Pro 570 GPU chipset retails for $1799. A 5K iMac with a 3.8 GHz quad-core i5 processor, a 2TB fusion drive, and the Radeon Pro 580 GPU sells for $2299.